David Isaac: a defender of free speech? New UK government guidelines say blanket bans (the so-called ‘no platform’) on speakers may be illegal, but ‘trigger warnings’ can be used to warn students about controversial speakers and issues. The guidance has been drawn up by the Equality and Human Rights Commission (EHRC), along with the National Union of Students (NUS), the Home Office, and other concerned bodies. Apparently, speech that incites “racial or religious hatred” will still be banned, though who decides what constitutes incitement before the speech remains unclear. And if you can form a large enough rentamob prior to a campus event and threaten the participants, then presumably “safety concerns” would result in the event being stopped as well. In the event of speakers or issues generating objections ‘trigger warnings’ will create ‘;safe spaces’ for those delicate students who can’t cope with certain matters being addressed, so that intellectual and emotional meltdown can be avoided. As the UK government attempts to encourage more ethnic and religious minority groups to attend university (though they may have to lower standards in order to do so) issues such as immigration and multiculturalism will remain firmly off the agenda at campus events as a result. For many, that will evoke little surprise, as such issues have been taboo for decades. 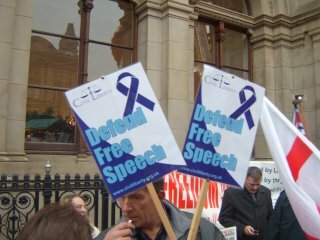 Free Speech: use it or lose it! Next Post What chance a white working class uprising if Brexit is dumped?